Many of the famous bridges in the United States are popular for more than just their architectural ingenuity and the amazing views they provide drivers – they’re also some of the scariest bridges in the country. Why are some bridges considered scary while others, well, aren’t not so much? Actually, some people find all bridges scary. Those individuals have gephyrophobia, which is a fear of bridges. I used to have acrophobia, which is the fear of heights – closely related to and often linked to gephyrophobia. And now I ride roller coasters on a weekly basis. (Go figure, right?) I combated my fear of heights through baby steps, which often helps gephyrophobics as well. Here’s a white-knuckle look at 5 of the scariest bridges in the United States. 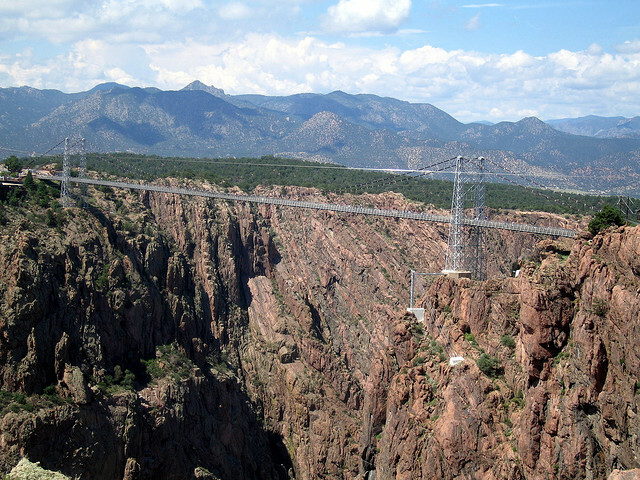 The Royal Gorge Bridge in Cañon City, Colorado, is actually a tourist attraction in Royal Gorge Park, a city-run theme park based on the Old West. The Royal Gorge Bridge, which serves the main attraction in the park, was built in 1929 and was, until 2003, the highest bridge in the world, with a height of 1,053 feet. No wonder it’s one of the scariest bridges in the United States! That’s like crossing a bridge higher than a 100-story skyscraper. The height record held by the Royal Gorge Bridge was eclipsed in 2003 by the Beipanjiang River Bridge, which stands in China at 1,201 feet high. Unfortunately, tragedy struck the Royal Gorge Bridge & Park in 2013, when a wildfire destroyed much of the theme park. Thankfully for the bridge, only some of its wooden deck planks were burned, and much of it has been replaced. The Mackinac Bridge was built in 1957 and spans the Straits of Mackinac, which divides the Upper and Lower peninsulas of Michigan. 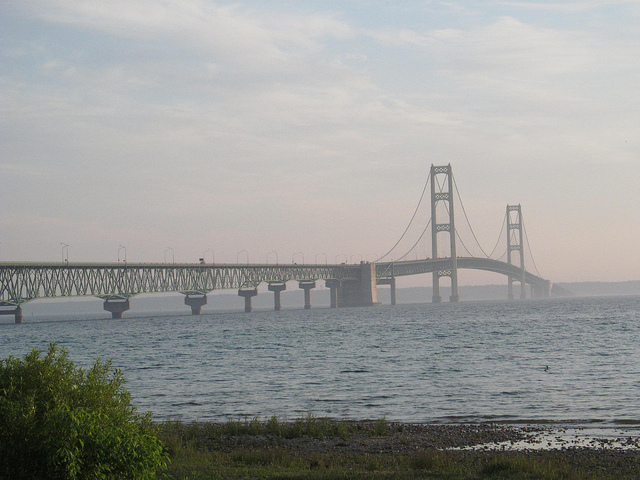 A segment of Interstate-75, the Mackinac Bridge is 26,372 feet long and ascends to a height of 200 feet above water. While the heights of the grand bridge are enough to scare some people from crossing the bridge, so, too, is the depth of the water – which is some 250 feet deep at the center of the straits. Crossing the bridge strikes enough fear in people to have caused the Mackinac Bridge Authority to offer a driver assistance program. 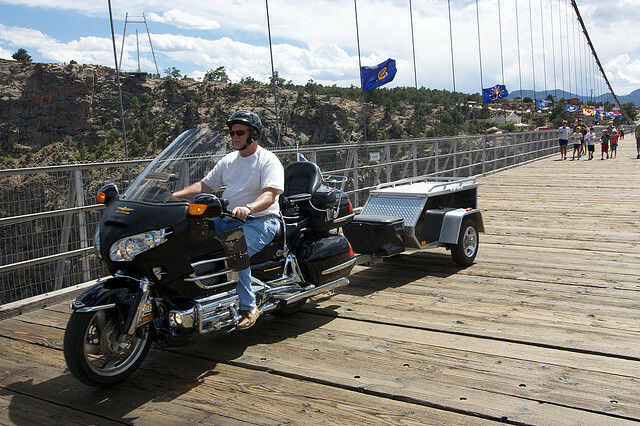 For no additional fee over the cost of the toll ($4 for passenger cars, $5 for motor homes and commercial vehicles), you can have your car or motorcycle driven over the bridge. Ever since the Bay Bridge (officially it’s the William Preston Lane, Jr. Memorial Bridge, so named for the governor who initiated its construction) opened in 1952, it has taxed the nerves of more than a few motorists. 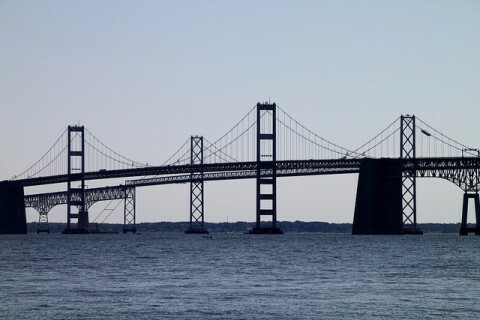 Imposing with its dual-span 200-foot-high road deck and 22,790-foot length, the Bay Bridge soars high above the Chesapeake Bay and can become a truly treacherous drive during storms, which happen frequently over that part of the Chesapeake. Realizing that the Bay Bridge is one of the scariest bridges in the United States, the Maryland Transportation Authority offers arrangements through private companies to help anxious motorists drive over the bridge for a fee. Connecting Knight’s Key to Little Duck Key, the Seven Mile Bridge is a 2-lane bridge causeway that carries Conch Nation residents – and gazillions of tourists – in and out of the ever-popular Florida Keys, which are only 90 miles north of Cuba. The original Seven Mile Bridge opened in 1912 and was initially a railway line. That changed in 1935, when the bridge became used for automobiles following necessary refurbishment after sustaining damage from a hurricane. The old Seven Mile Bridge featured a swing-span segment to boat traffic to pass. 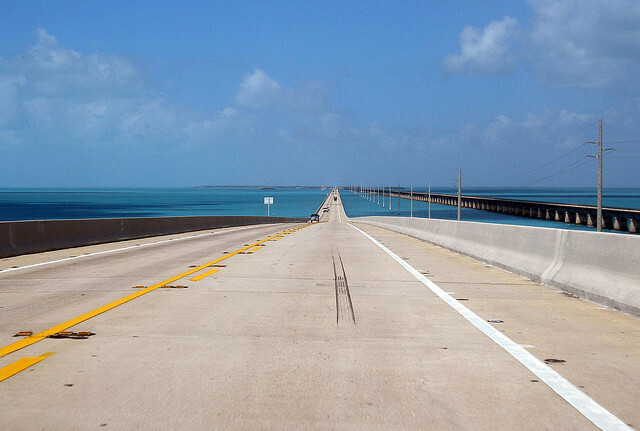 In 1982, the new Seven Mile Bridge opened, though it’s a wee bit shorter in length than its name suggests – 6.79 miles. However, a shortchanging of about 2/10ths of a mile is probably welcome to those who get nervous about crossing this long bridge, which is frequently subjected to high winds and thunderstorms. 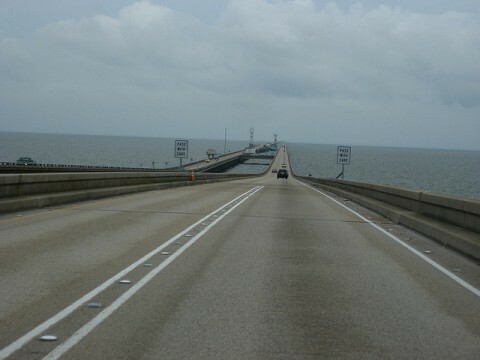 The world’s longest continuous bridge over water, the nearly 24-mile-long Lake Pontchartrain Causeway Bridge connects New Orleans to Mandeville, Louisiana. Crossing the Lake Ponchartrain Causeway Bridge takes a lot of guts for someone who has aquaphobia – the fear of water, that is. Why? That’s because land can’t be seen by motorists who are crossing the middle 8 miles of the bridge, making this one of the scariest bridges in the U.S. So, pretty much, you’ll feel like you’re driving your car over the open sea when you’re crossing the Lake Pontchartrain Bridge! Police who patrol the bridge have reported having to rescue anxious drivers who become scared while crossing the bridge and literally stop their cars on the middle of the roadway. These panic-stricken motorists have to be driven across the bridge by police officers. The southbound span of the bridge, which has a $3 toll, opened in 1956. The northbound span opened in 1969. Amazingly, the Lake Pontchartrain Causeway Bridge was one of the few major causeways in the New Orleans area that were still passable in the days following Hurricane Katrina in 2005.